Ötzi the iceman could not do without wood when he was climbing his Alpine glacier, nor could medieval cathedral-builders or today's construction companies. From time immemorial, the skill of the human hand has developed by working wood, so much so that we might say that the handling of wood is a basic element in the history of the human body. The fear of a future wood famine became a panic in the 18th century and sparked the beginnings of modern environmentalism. 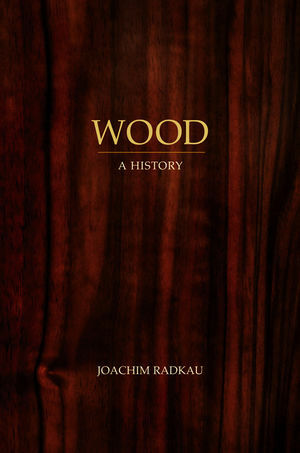 This book traces the cultural history of wood and offers a highly original account of the connection between the raw material and the human beings who benefit from it. Even more, it shows that wood can provide a key for a better understanding of history, of the pecularities as well as the varieties of cultures, of a co-evolution of nature and culture, and even of the rise and fall of great powers. Beginning with Stone Age hunters, it follows the twists and turns of the story through the Middle Ages and the Industrial Revolution to the global society of the twenty-first century, in which wood is undergoing a varied and unexpected renaissance. Radkau is sceptical of claims that wood is about to disappear, arguing that such claims are self-serving arguments promoted by interest groups to secure cheaper access to, and control over, wood resources. The whole forest and timber industry often strikes the outsider as a world unto itself, a hermetically sealed black box, but when we lift the lid on this box, as Radkau does here, we will be surprised by what we find within. Wide-ranging and accessible, this rich historical analysis of one of our most cherished natural resources will find a wide readership. Joachim Radkau is professor of modern history at Bielefeld University. "Wood is masterful scholarship. I recommend it with admiration." "An ambitious feat which has been very well researched and nicely written. It is an academic cover-to-cover read, but Radkau's enthusiasm for the subject and accessible delivery will draw readers in; it has the potential to appeal to the general reader as well as the academic." "Both entertaining and informative - highly recommended." "Radkau's scholarship is of the highest quality, indeed impeccable. His main argument, that wood is a material of fundamental importance in history, is well-supported and compelling. This book will appeal not only to undergraduate and graduate students in history and Environmental studies: it will also attract a wide general readership, comparable to Mark Kurlansky's books Cod and Salt and even Nathan Lewis' Gold in terms of potential popular appeal." "Joachim Radkau has set the agenda in German forest history for a generation. At last, one of his major works on this theme is available in translation. English-speaking historians should sit up and take notice: their world will look different after reading Radkau's work." "A rich, engaging, and important history of one of the most important of all the materials used by human societies." Wide-ranging and accessible, this rich historical analysis of one of our most cherished natural resources will find a wide readership."